In a wide-ranging interview, Myeshia Johnson, the widow of Sgt. 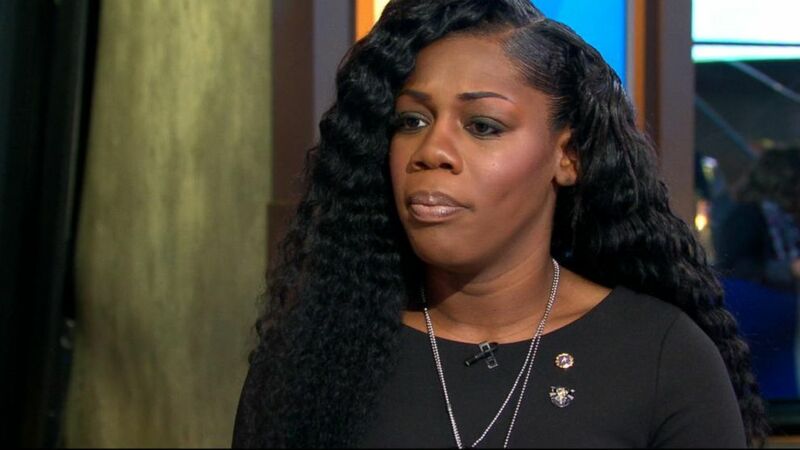 La David Johnson, spoke out on “Good Morning America” about her husband’s death during a mission in Niger and the controversy that has surrounded it. She told ABC News’ chief anchor, George Stephanopoulos, that she was upset about remarks President Trump made during a condolence call and said she has many unanswered questions. George Stephanopoulos: We’re joined now by the widow of Sgt. Johnson, Myeshia Johnson. Myeshia thank you for coming in this morning. I hope you’re feeling the prayers the thoughts of all of us. GS: You know it was so clear watching the funeral how loved and respected La David was by his family, his friends, his community, his fellow soldiers. What do you want people to know about him? MJ: Well, I want the world to know how great of a soldier my husband was and a loving and caring father and husband he was to our family. GS: You knew him since you were six, huh? GS: And I also know you have a lot of questions about what happened. GS: In Niger, What’s at the top of your mind? MJ: The questions that I have that I need answered is I want to know why it took them 48-hours to find my husband; why couldn’t I see my husband? Every time I asked to see my husband they wouldn’t let me. GS: What did they tell you? MJ: They told me that he’s in a severe, a severe wrap like I won’t be able to see him. I need to see him so I will know that that is my husband. I don’t know nothing they won’t show me a finger, a hand. I know my husband’s body from head to toe. And they won’t let me see anything. I don’t know what’s in that box, it could be empty for all I know. But I need, I need to see my husband. I haven’t seen him since he came home. GS: And what have they told you about what happened in Africa? MJ: I really don’t know the answers to that one neither because when they came to my house they just told me that, um, it was a massive gunfire and my husband as of October 4th was missing, they didn’t his whereabouts. They didn’t know where he was or where to find him and a couple days later is when they told me that he went from missing to killed in action. I don’t know how he got killed, where he got killed or anything. I don’t know that part they never told me and that’s what I’ve been trying to find out since day one, since October 4th. GS: Are you confident you’re going to get the answers you need? MJ: If I keep pushing for them I will. GS: And they say they don’t know? MJ: They wont tell me. They won’t tell me anything. I don’t know anything. GS: There are also a lot of questions about the phone call you received from President Trump. I know you were in a car to the airport. Tell us what happened next. MJ: Yes the President, said that he knew what he signed up for, but it hurts anyway. And it made me cry cause I was very angry at the tone of his voice and how he said he couldn’t remember my husband’s name. The only way he remembered my husband’s name is because he told me he had my husband’s report in front of him and that’s when he actually said La David. I heard him stumblin’ on trying to remember my husband’s name and that’s what hurt me the most, because if my husband is out here fighting for our country and he risked his life for our country why can’t you remember his name. And that’s what made me upset and cry even more because my husband was an awesome soldier. He did what it take other people like five years to do in three years. So imagine if my husband was here now. It took my husband three years to make E-5 — it takes other soldiers five to six years just to make E-5. So if he was here now he woulda been on his way to bein’ the E-6 or E-7. My husband had high hopes in the military career. GS: What did you say to the President? GS: But you were upset when you got off the phone? MJ: Oh very, very upset and hurt. Very it made me cry even worse. GS: Congresswoman Wilson reported that and you explained she was in the car with you. GS: She’s been close with your family for a long time? MJ: Yes. Ms. Wilson, my uncle-in-law was Ms. Wilson’s elementary school principal and my husband was in her 5,000 role model program that’s why she’s well connected with us because she’s been in our family since we were little kids. GS: The President said that the congresswoman was lying about the phone call. MJ: Whatever Ms. Wilson said was not fabricated. What she said was 100 percent correct. It was Master Sgt. Neil, me, my aunt, my uncle and the driver and Ms. Wilson in the car, the phone was on speaker phone. Why would we fabricate something like that? GS: Is there anything you’d like to say to the President now? MJ: No. I don’t have nothing to say to him. GS: Your little girl’s going to be born in January. GS: What are you gonna tell her about her dad? MJ: I’m gonna tell her how awesome her dad was and how a great father he was and how he died as a hero. GS: Words she’s gonna love to hear Myeshia thank you for sharing your story this morning.